I did the Duxbury Craft Showcase over the weekend in Duxbury, MA. As craft fairs go, it was the usual. I've been doing craft fairs since 1996 when I first debuted at ACC Baltimore Wholesale Show, my first big craft fair. Since then, I've gone to do most of the major craft shows on the East Coast. I've avoided doing fairs out in the midwest or on the West Coast. The logistics of trying to transport or ship my booth was daunting, plus having to fly, so I prefer to drive to any fair. I've driven to Chicago, Altanta, Washington DC ( DC in particular many times), NYC and more. Now I just confine myself to NH, RI, CT and MA, where it's easy enough to drive and I have a clientele. I only do the Annual Craftsmen's Fair at Mt. Sunapee Resort every August as my only NH fair. I've done both mid-range and high end craft shows such as CraftBoston in MA, and always do the RISD Alumni sales in RI. For CT, sometimes I'll do the Guilford Craft Expo, althought the excessive heat and humidity in July has made me reconsider ever doing that show again. High heat and humidity is really hard on me, and doing a 3 day craft show with very long hours ( 10 hours easily) is too much. People think craft fairs are easy to do, fun to go and newbies think they can do a killing at a craft show. Once you've done your first craft show and do a few more, you realize just how much work it is to get ready, have plenty of stock, set up your booth, stand on your feet for 5-10 hours for a few days, and then tear down your booth for loadout. By the time you get finished putting together your expenses, travel, food, gas, etc, and then if you have a lousy fair, you've not made your expenses. Craft fairs were booming in the 1980's and 1990's but by the end of the 90's, too many fairs and now the bad economy has made craft fairs unprofitable. The customer base is simply not there anymore. Also, there is too many craft fairs, and people think they can get a bargain buying crafts. I get really irritated when people ask if I can do better on my price. I've put my prices as low as I can and still cover my labor and material costs. I'll only raise my prices if the cost of materials goes up which it has gone up a lot this year. 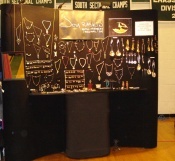 As for my fair booth, I've experimented over the years with various booth configurations, and am on my 3rd booth setup. Most fair exhibitors generally start out with a table with a cloth thrown over it and work spread out, and work up to pipe and drape, which is a pipe framework with curtains hanging from the top bars. I've had pipe and drape for a 10 x 8" space, but after using it for 6 years, I was sick of it since it would take a hour just to get the corner bolts together. I had display cases that would take 2-4 hours to set up which after 2 years, I sold off them and moved onto long narrow display tables that broke down easily. A few years ago, Kathleen Dustin ( polymer clay artist) and I were doing a fair together, and she had a new booth that I admired, so I got the booth info. It's a pop up wall, that was used in corporate conventions for many years, but it's slowly making it's way into the craft world. I went out and got a couple of pop up walls ( see www.aceexhibits.com for their walls) that I can set up in less than 10 minutes and looks very professional. Best of all, it breaks down into a compact pile that will fit into a small car. That's really important if you are a fair exhibitor that your booth can fit your vehicle. Since the wall panels are carpet, I can use velcro to attach things to the wall or use straight pins to pin things on. After years of cumbersome, bulky jewelry cases, I love to hang my jewelry and flatware right on the walls. It looks better hanging up and you can see it better. The key thing with booth display is to keep it clean, organized, very well-lighted, prices attached to each item on display and accessible for people to touch, try on or handle. Also, don't cram so much stuff into a small space or you get overwhelmed trying to see everything. I've seen booths that were so overloaded with stock, you couldn't focus on anything. My mom tend to walk by booths that are too busy. Less is better. Showcase each piece rather than jumble them all together. I've learned over the years how to display my work, and doing an exhibit layout every year for the League of NH Craftsmen's fair, I gain more info about effective displaying. I never thought I would be doing exhibit layouts but it's good training for me.